It’s a good thing we have a “legal tampering period” in NFL free agency. That prevents teams from ever talking to potential free agents about contracts before that period begins. The Oakland Raiders are just really fast at negotiating deals. They agreed to a four-year, $66 million deal with $36.75 million guaranteed, the largest contract ever for an offensive lineman, according to ESPN’s Adam Schefter. Schefter tweeted that news at 12:09 Eastern time. The tampering period started at 12 p.m. The Raiders, who somehow were rumored to be interested in Brown for a while but wouldn’t dream of tampering before it was allowed, negotiated a $66 million deal in nine minutes apparently. Given that it had to take some time to text Schefter, and for him to then tweet the news with the exact figures, the Raiders had to have actually negotiated that deal with the former Patriots tackle in less than nine minutes. What an impressive feat. Long story short: You want Jon Gruden doing your taxes, or any incredibly complicated contractual matter you have. There’s clearly no chance they broke the rules and talked to Brown about a contract before the tampering period. Good offensive tackles are hard to find. They’re hard to evaluate in the draft due to the proliferation of spread offenses, and rarely hit free agency. That’s how someone like Brown who gets to the market is going to get paid a huge sum. 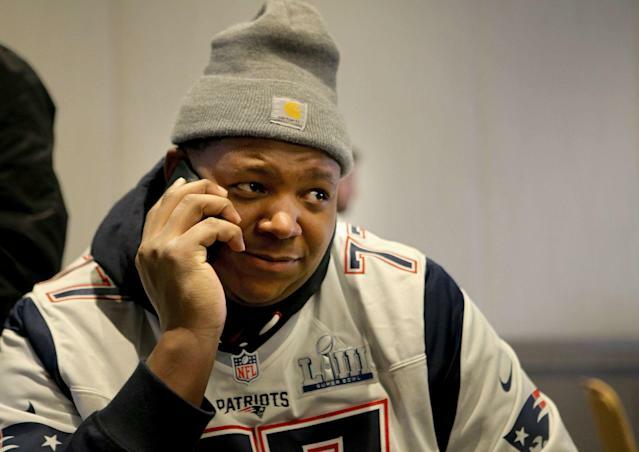 Brown, best known for his 6-foot-8, 380-pound frame, had a good year with the Patriots. The Patriots acquired him from the San Francisco 49ers, shipping a third-round pick to the 49ers for Brown and a fifth-round pick. Brown started 16 games at left tackle for the Super Bowl champions, developing well under the tutelage of offensive line coach Dante Scarnecchia. Then he got paid. And the funny thing is, there’s a good chance the Patriots are going to get a third-round compensatory pick back for the Raiders signing Brown, meaning they got a year of Brown and a fifth-round pick virtually for free. The Raiders used a high first-round pick, passing on future All-Pro safety Derwin James among others, to draft offensive tackle Kolton Miller last spring. The addition of Brown means Miller will move to the left side. The Raiders also traded guard Kelechi Osemele, a quality player coming off a down year, to the Jets to clear salary-cap space, which they gave to Brown in a record deal. It’s not the Antonio Brown trade, which will win all the headlines, but the Trent Brown move also should help the Raiders offense. And to think, it took them less than 10 minutes to negotiate that entire deal.